Prior BlueSheepdog podcast guest Steve Rabinovich published an article on self-care and buddy-care at PoliceOne.com. Providing detailed examples of officer involved shootings, Steve talks about the importance of being able to self-manage wounds until you can be evacuated for treatment. As he did in our podcast, Steve highlights the importance of having, and being able to apply, a tourniquet. I highly recommend checking out BlueSheepdog podcast #12. Take the below video. Officers responded to a 911 call from a motorist who said a man walking down the road with a pistol, pointed the gun at her. Officers located the man, and a resident in the area, filmed part of the incident with his camcorder. The three tiers of citizen-police encounters, consensual encounters, investigative detentions and arrests, are the topic of today’s podcast. We cover the basics of Terry v. Ohio. I talk about what can escalate a consensual encounter or detention to the next level, even if you did not intend to escalate. The folks over at The Box o Truth ran a series of tests based on a real-life scenario presented by a SWAT sniper. The sniper had been involved in a shooting where an armed, barricaded subject was wearing multiple concealable vests with trauma plates. The subject made threats to kill citizens and officers, and the sniper ultimately was forced to shoot the subject to end the danger. As the subject’s mobility was somewhat limited, the sniper was able to make a head shot. His questions regarded the ability of his .308 to penetrate three vests and trauma plates, and if the entry team’s .223 rifles would penetrate. I found the results somewhat surprising. At 58 yards (the distance the sniper was from the subject), the .308 would not have penetrated all three vests and trauma plates. Neither would the .223 at closer distances. Both rounds did penetrate all three vests without trauma plates. I would have figured the .308 would punch through all three plates and vests, so it is a good thing I wasn’t placing money on the testing. The tests are not scientific, but they do give you something to consider. Click the link above to see the photos and full information. 5.11 is commemorating the tenth anniversary of the attacks on the World Trade Center, Pentagon, and Flight 93 with a fundraiser that will benefit the National Law Enforcement Officers Memorial Fund and the FDNY Foundation. All profits from the special logo 9.11 collection will go to these charities. The items for sale bear a distinct design honoring the police officers, firefighters, and citizens who bravely lost their lives in the terrorist attacks. Collection items include hats, patches, pins, challenge coins, shirts, and bags. “This is one way for us to show public safety officers across the country that we will not forget their sacrifices,” explains Dan Cost, CEO of 5.ll Tactical. A Clark County Sheriff’s Office, WA, Police K9 was stabbed to death this week. K9 Kane and Deputy Rick Osborne were attempting to apprehend suspects wanted for auto theft and eluding a police officer. It is reported that the suspects tried to ram a police car. The suspects bailed out of a stolen car and ran. Osborne sent Kane to detain one of the suspects, Keegan H. Graves. Kane was stabbed repeatedly by Graves during a protracted struggle. 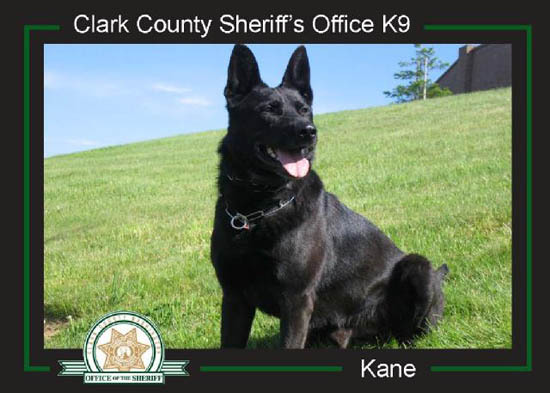 Kane subsequently died at a local animal hospital, according to CCSO. Both suspects were captured. Graves was charged with Harming a Police Dog, Auto Theft, and Eluding Police. The second suspect was arrested for an outstanding warrant.